Do you know whether you have a hungry soul? 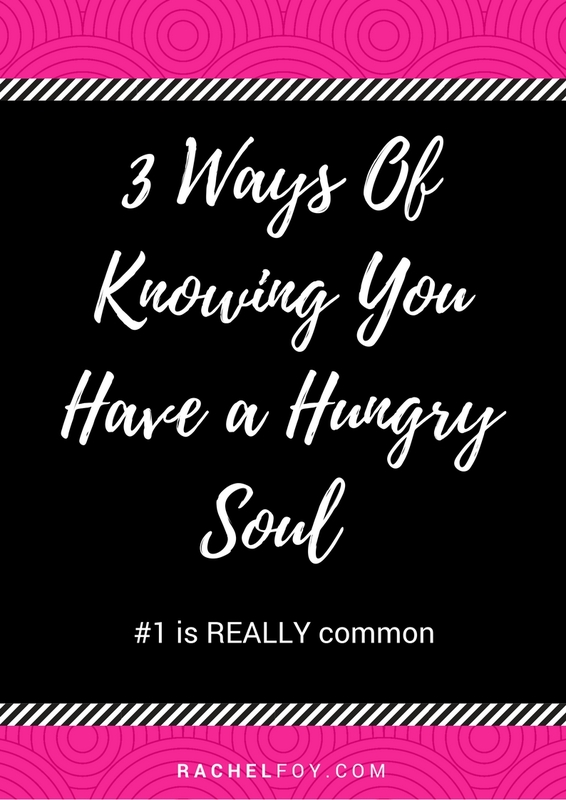 I want to share with you the 3 most common ways of identifying whether you have a hungry soul, as once you know, you can then start finding ways to feed these non physical hungers so that you feel happier, more connected and more alive! 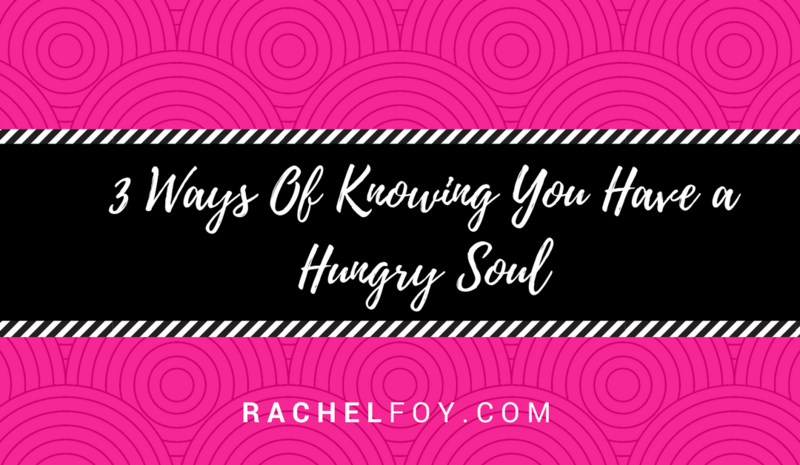 Hi gorgeous it’s Rachel here and I want to have a quick conversation with you about three ways of knowing if you have a hungry soul. So the first thing to be aware of if you have a hungry soul yourself right now is the chances are that you will be filling these voids with stuff. It could be food, so you might be turning to chocolate when you feel stressed, you might be eating crisps when you’re overwhelmed or you feel desperate to eat a massive piece of cake because you’re feeling worked up by something or by someone! So food is a really common one. If you are an emotional eater, if you struggle with overeating, if you have food cravings, if you find yourself with your head in the biscuit tin as soon as the children come home from school or as soon as you get home from work, really have a look past the food stuff as I promise you that food is not a problem, it’s literally a symptom. Now some of the other things which we can turn to, apart from food could be alcohol. Do you open a bottle of wine when you come home from work in the evening when the children have gone to bed and you find yourself having more than the one glass which you intended to? Again this could be just something that you have gotten into the habit of doing but it could also be indicative of having a hungry soul. Something else is compulsive shopping. Do you find yourself walking down the high street and you have this overwhleig desire and urge to just spend money and you find yourself coming home with bags of things which you really don’t need and maybe don’t even like?? That energetic state of overwhelm, feeling frantic and adding things to the list is another way of knowing you have a hungry soul. Usually underneath that state there may be a bit of anxiety or worry which is not a comfortable place to be in, especially if you are in it every single day from an energetic point of view. When our souls are fed with these non physical hungers (more to come on that in another episode) this energetic state changes, so instead of being overwhelmed and frantic and busy and doing, it becomes more balanced, calming and it flows with ease and contentment. We shut ourselves out of our own lives. But again if you are doing this repetitively and consistently and it’s now become your norm, there is a part of your soul which isn’t being fed. A soul fed women doesn’t cruise through her life on autopilot, she experiences it, everything. Living in the moment, being present and embodied, so that is something I invite you to have an awareness of. Is that something which you do right now? Honestly for all of us, the life which we have right now, we all have a choice to change it if we wish. One of the biggest things which made a massive difference for me when I was struggling with diet and weight obsession (underneath all of that I did have a hungry soul to the point where it was starving) when I started to learn to be more present and less detached, listening to myself and feeding these hungers in a non physical way, life started to change and I really want you to start having an awareness of this today. Do you fill your voids? Do you feel overwhelmed and frantic more times than not? Do you cruise through your life on autopilot worrying about the past and anxious about the future, spending all your time in your head and you miss the moment? When you can start to recognise and acknowledge those things and then take steps to start changing them, everything will shift. You begin to feel more confident, more empowered, more embodied, more connected, more present! You have a right to experience all of that and more! Want some extra help with feeding your Soul Hunger?